While majority of CIOs in New Zealand say their role is becoming 'increasingly more challenging', an equal percentage say their current career is becoming 'more rewarding'. The growing focus on digital transformation of organisations across sectors, geography and of all sizes, is making the CIO role more critical, strategic - and challenging. CIOs find themselves managing a number of significant issues - while their respective organisations are revising business models and finding the balance of skill sets needed in the digital era. The 2016 State of the CIO research looks at how the men and women in the role are meeting this challenge, and how CIOs view their future responsibilities and those of their teams. The international survey finds CIOs focusing on three different areas: strategy – strategic initiatives, growth and innovation activities; transformation – leading change efforts aligning IT initiatives with business goals, implementing new systems and architecture and cultivating the IT/business partnership; and function – managing expenses, security and IT crises, and improving IT operations. An interesting insight is that while the majority of CIOs in New Zealand (86 per cent; compared to 88 per cent globally) say their role is becoming "increasingly more challenging", an equal percentage of the local respondents also say their current career is “becoming more rewarding”. 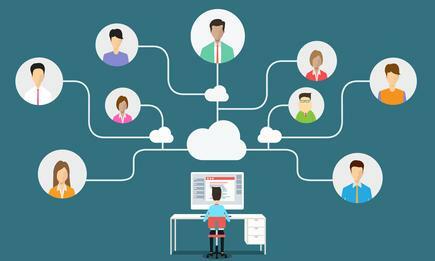 That 86 per cent of CIOs in New Zealand and 84 per cent across the globe say their role is becoming more important to the business, goes some way to explaining this. If at all, the key challenge for CIOs is finding the correct balance between business innovation and operational excellence. In New Zealand, 77 per cent of respondents agree with this, slightly higher (71 per cent) to their global counterparts. Across the globe, 46 per cent of respondents report to the CEO, followed by 15 per cent reporting to the CFO, 12 per cent to the chief operating officer, and 11 per cent to the corporate CIO, and the rest reporting to other executive roles. These reporting lines are also similar to New Zealand: 39 per cent report to the CEO, 18 per cent to the CFO; and 9 per cent to the COO. 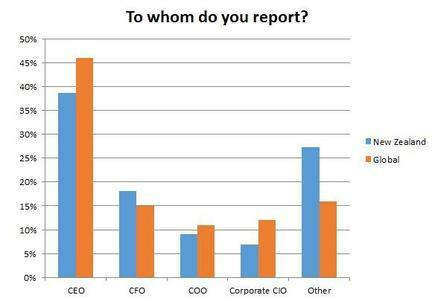 Seven per cent report to the corporate CIO, with 27 per cent reporting to other executive roles. 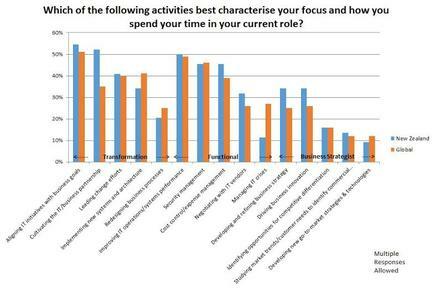 We asked CIOs what they focus on when working within a transformational role at work. Aligning IT initiatives with business goals and cultivating the IT/business partnership came out on top, followed by leading change efforts, implementing new systems and architecture and redesigning business processes. While local CIOs share the number one concern on the transformation front with their global peers, across the globe the second most important concern was implementing new systems and architecture. When working on their functional challenges, New Zealand CIOs share the top three concerns with their global counterparts, but more of them spend time negotiating with vendors (32 per cent here; 26 per cent global) and less time with managing IT crises (11 per cent here; 27 per cent global). As business strategists, New Zealand CIOs nominate developing and refining business strategy and driving business innovation, as the tasks they spend the most time on. Their global counterparts listed driving business innovation as their top activity in this area. The study finds IT security and IT spending are not in complete alignment, but respondents believe this will be less so in the near future. Over the next three to five years, our research shows CIOs in New Zealand and worldwide see themselves driving business innovation when they take on the business strategist role. The top choice, however, differs when they undertake their transformational goals. 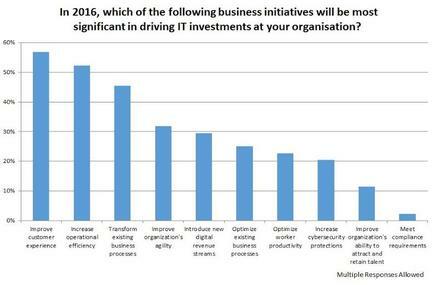 For New Zealand CIOs, this was aligning IT initiatives with business goals (41 per cent, compared to 30 per cent globally). Internationally, CIOs see themselves leading change efforts as the top goal (35 per cent). Locally, this goal was number four. As functional CIOs, security management will rise to the top of their focus in the next three to five years, according to both local and global respondents. Managing IT crises was the least preferred option (none of the CIOs here chose this) for CIOs across the globe. 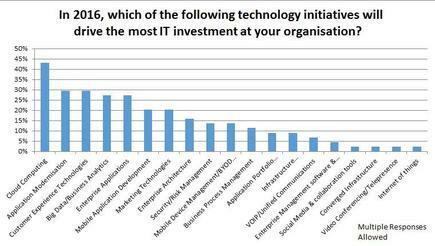 When asked which other groups or functions in the organisations have budgets specifically earmarked for investments in technology products and services, three came out on top. 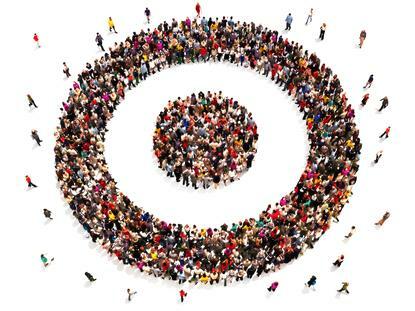 Marketing was number one in New Zealand, (43 per cent) but second only (32 per cent) worldwide. Operations came second in New Zealand, (34 per cent) while this was the number one internationally (cited by 37 per cent of respondents). The third was for finance and accounting for all organisations. 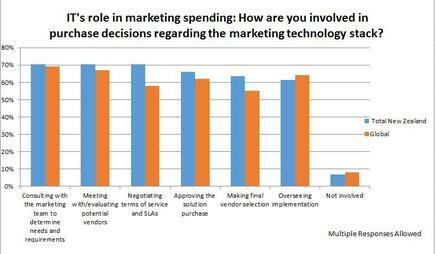 The survey notes most CIOs are involved in purchasing decisions for marketing technology. Less than 10 per cent (7 per cent in New Zealand; and 8 per cent across the globe) say they are not involved. Internationally, CIOs are involved in consulting with the marketing team to determine their requirements and meeting with or evaluating potential vendors. They also oversee implementation of these technologies (61 per cent in New Zealand, 64 per cent globally). The top three investment drivers in New Zealand to meet business initiatives are improving customer experience (CX), increasing operational efficiency and transforming existing business processes. Across the globe, these are also the top three investments for the business, but with a slight difference - increasing operational efficiency leads internationally, followed by improving CX and transforming existing business processes. The technologies that will drive the most IT investments in New Zealand, meanwhile, are cloud computing, application modernisation, customer experience technologies, big data and enterprise applications. Across the globe, cloud computing is the top investment (30 per cent) and nearly equal (at 29 per cent) with security/risk management (number nine in New Zealand). Customer experience - number three among New Zealand CIOs - is ranked down at number seven, at par with enterprise architecture. New Zealand CIOs say their CEO’s top three priorities this year are completing a major enterprise project, helping reach a specific goal for corporate revenue growth and to simplify IT. These are followed by leading a product innovation effort, reducing IT spending by a certain percentage and collaborating with the CMO or chief digital officer on a major customer initiative. 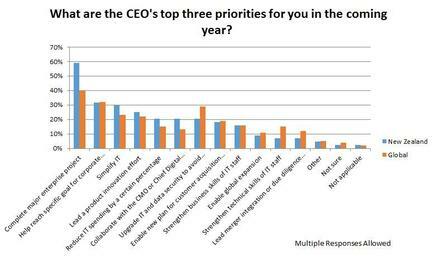 Upgrading IT and data security to avoid cyberattack follows, though globally cybersecurity ranks third among the CEO’s priorities. For instance, when asked how tightly integrated IT security strategy and IT strategy are in their organisations, 41 per cent in New Zealand (37 per cent globally) say it is tightly integrated, where IT security strategy is an integral part of overall IT strategy and roadmaps. A higher percentage (45 per cent in New Zealand, 47 per cent globally) describes the relationship as “somewhat integrated” or loosely incorporated into overall IT strategy. The rest (14 per cent in New Zealand, 16 per cent globally) say the two areas are not integrated at all. This means IT security investments are typically reactive in response to existing IT security challenges or events. Three years from now, they expect the gap to lessen, with an overwhelming majority of local respondents (86 per cent), compared to 74 per cent globally, saying the two areas would be tightly integrated by then. 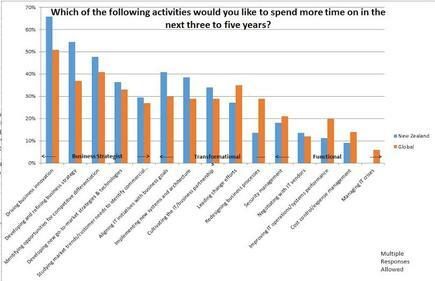 Over half (52 per cent) of the New Zealand respondents expect their organisation to experience skills shortages. The top five areas where they anticipate the most difficulty in finding the appropriate skillsets are: Security/risk management, big data/business intelligence and analytics, application development/programming/DevOps, enterprise architecture and business-IT liaison/business relationship management. Across the globe, CIOs say the top five areas where they expect to have the most difficulty recruiting are big data/business intelligence and analytics, security/risk management, application development/programming/DevOps, business-IT liaison/business relationship management, and cloud services. This is part one of the New Zealand edition of the 2016 State of the CIO report. Part 2 of the report discusses how CIOs are meeting the digital transformation challenge in 2016 - and beyond. A key challenge for CIOs In New Zealand and across the globe is finding the right balance between business innovation and operational excellence.